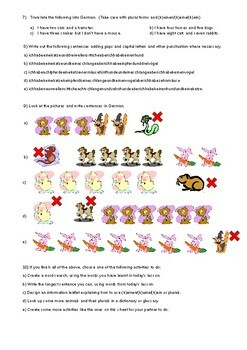 A double sided worksheet that will last an entire lesson. Ideal for cover work. Students can work independently on a variety of tasks of increasing difficulty. Answers and other useful vocab provided for non-specialist cover teachers. Ideas for open ended tasks provided at the end as an extension or for early finishers. 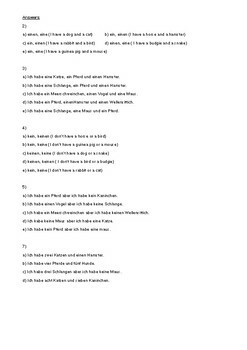 Language included = 10 animals and their plurals, numbers up to 10, einen/eine/ein and keinen/keine/kein. Could be laminated and used again in the future.